Learning to recognise musical intervals (distances between two notes) by ear is imho and essential skill for progressing musicians in every style and every instrument. Developing this skill will improve your whole musicality, help you to transcribe songs by ear and you understanding of the fingerboard. In this app I give you two sound choices piano or guitar and two input options for your answers, a piano keyboard and a guitar fretboard. I think guitarists should be using both sounds and both interfaces, while most other instrumental players will stick to the piano input I suspect. 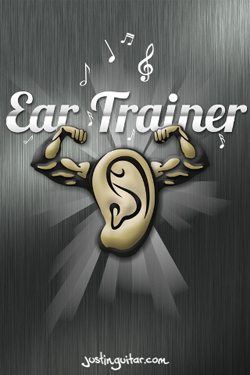 To make the most of the app you will most likely want to check out my free Aural Training Course which will explain the best way to learn this skill. The app follows the same sequence of learning as the course so will compliment it perfectly. Hope you enjoy it, email me your suggestions for improvement and I'll try and get as many done as I can in future updates! If you like it, please review and rate it on the app store.